Australia head coach Michael Cheika. UNDER-FIRE WALLABIES HEAD coach Michael Cheika insists he is the man to overturn Australia’s worrying form despite another loss in the Rugby Championship. Australia remain bottom of the Rugby Championship standings following Saturday’s 23-12 defeat to South Africa in Port Elizabeth. The Wallabies have lost four of five games and eight of their past 10 Tests as pressure mounts on Australia boss Cheika. It has been a dismal campaign for the Wallabies but Cheika – who was named Coach of the Year after leading Australia to the 2015 Rugby World Cup final – remains defiant. 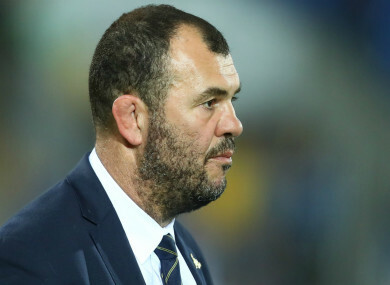 “You keep asking the same question every week but I’m not changing,” Cheika said. “No one wants to win more than me, trust me. I think that’s pretty obvious. “But like I said before tough situations come and then they go away and the tough people will stay. You can cry about it and sook or you can go about getting improvements. “I think we made improvements this week and things haven’t been going for us either. You have to ride that out and come out on the other side. “We are a strong group together – the playing group and the staff around them. Wallabies captain Michael Hooper added: “I’m gutted we couldn’t get the result, but clear on the things we did well… [and] that there’s a way forward for this team. It was another positive result for the Springboks, who backed up their stunning win over world champions New Zealand last time out. Two tries from Aphiwe Dyantyi and Faf de Klerk set the tone for South Africa, though coach Rassie Erasmus rued missed chances. “I think we created more chances than we did against New Zealand and if we had converted some of those the game would have gone very differently,” said Erasmus. “If we’d taken them we could have given them a hiding. Email “Cheika defiant despite Wallabies woes after Springboks loss”. Feedback on “Cheika defiant despite Wallabies woes after Springboks loss”.